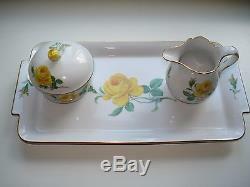 Antique A beautiful Meissen tea set including a creamer, sugar bowl with lid, two cups and saucers and serving tray. It is a bright yelloow rose pattern. The sugar bowl lid are topped with a 3 dimensional porcelain rose. Sugar bowl 2 1/2" tall including lid, Creamer 3" tall. In Good Condition with no chips. The item "Meissen Tea Set Tray Cream Sugar Cup Saucer Rose Pattern" is in sale since Thursday, July 27, 2017. This item is in the category "Pottery & Glass\Pottery & China\China & Dinnerware\Meissen". The seller is "szebarbara74" and is located in New Haven, Connecticut. This item can be shipped to United States, Canada, United Kingdom, Denmark, Romania, Slovakia, Bulgaria, Czech republic, Finland, Hungary, Latvia, Lithuania, Malta, Estonia, Australia, Greece, Portugal, Cyprus, Slovenia, Japan, Sweden, South Korea, Indonesia, Taiwan, South africa, Thailand, Belgium, France, Hong Kong, Ireland, Netherlands, Poland, Spain, Italy, Germany, Austria, Israel, Mexico, New Zealand, Singapore, Switzerland, Norway, Saudi arabia, Ukraine, United arab emirates, Qatar, Kuwait, Bahrain, Croatia, Malaysia, Brazil, Chile, Colombia, Costa rica, Panama, Trinidad and tobago, Guatemala, Honduras, Jamaica, Barbados, Bangladesh, Bermuda, Brunei darussalam, Bolivia, Ecuador, Egypt, French guiana, Guernsey, Gibraltar, Guadeloupe, Iceland, Jersey, Jordan, Cambodia, Cayman islands, Liechtenstein, Sri lanka, Luxembourg, Monaco, Macao, Martinique, Maldives, Nicaragua, Oman, Peru, Pakistan, Paraguay, Reunion.